Ghost in the Shell Review | Nerd Much? The original Ghost in the Shell was released back in 1995 to high critic and fan praise, thanks to its gorgeously realized world, fantastic characters, and a story that offered a level of depth that anime today still strive to reach. So it was inevitable that once Hollywood ran its course of superhero films, its gaze would turn to one of the other major, untouched market: anime. Getting a big budget version of Ghost in the Shell doesn’t sound all that bad, as it’s not a show but a simple 90-minute film — meaning that the adaptation could be fairly straight forward. Yet, what we’re left with is a movie that’s visually stunning, sure, yet removes all the complex talk about human identity in an age of machines. That’s not to say Ghost in the Shell is bad, but simply mediocre, thanks to a handful of problems — yes, one of those being race. For those who haven’t seen Ghost in the Shell, the plot revolves around a not too distant future where people have begun enhancing themselves with cybernetics to further evolution. However, this is taken to the extreme with a woman known only as the Major (Scarlett Johansson) whose body was heavily damaged during a terrorist attack. Thanks to the advancements in science, her brain was put into a cybernetic body, making her the first of her kind and an asset to an anti-terrorist force known as Section 9. One thing leads to another and Major quickly discovers not everything is as it seems, causing her to travel further down the rabbit hole in order to uncover who she really is. This is the basic frame of the original anime, but it’s pretty clear that director Rupert Sanders decided to focus more on the elaborate set pieces than the smaller nuances of the story. All of the cool moments are there, such as the robotic geishas and a chase through the marketplace, but when these actions sequences are not on display, the movie is remarkably boring. Character development is kept to a minimum, with only the likes of Major receiving a backstory. This is a shame because the Ghost in the Shell movie had the opportunity to explore other characters like Batou (Pilou Askbæk) and Aramaki (Takenshi Kitano) in new and interesting ways. Yet, these side characters are shoved relatively to the background, despite the story desperately needing to expand upon their backstories. While the performances from Askbæk and Kitano are nearly spot on to their anime equivalents, it feels superficial as their moments on screen are reserved mainly to spouting either one liners, expositions, or taking part in some highly stylized action sequences. Even the antagonists are paper thin, with their motives lacking any real complexity beyond being evil for the sake of it. Ghost in the Shell never strives to challenge its audiences, but it instead baby’s them with bland often overly bold themes. However, most of the story rests on Johansson’s shoulders, and she does an admirable job of bringing this legendary character to life. Major has enough complexity to be interesting, with Sanders giving her enough screen time in the slower scenes to establish a backstory, her relationships with everyone, and most importantly how she perceives herself as the perceived next step in evolution. Despite the controversy around the actual race of the actress portraying her, Johansson gives a sold performance when it comes to bringing the Major to life. Even though the majority of the Major’s emotional range spans from bored to confused, it works with the character up until the big “twist” ending. Spoiler Alert! Spoiler Alert! We’re Gonna Talk Briefly About the Ending! Okay, so the big twist is that Major’s mind is actually that of a Japanese teenager named Motoko Kusanagi that was captured during a raid. This means that despite being white, Major is inherently Japanese, which honestly is asking for controversy. Not only is this a puzzling choice, but it makes one wonder why even set this movie in Japan to begin with. None of the major characters with the exception of two are Asian, and only one that appears on screen actually speaks Japanese. The exact same story could have easily been placed in America or the United Kingdom with largely the same result. 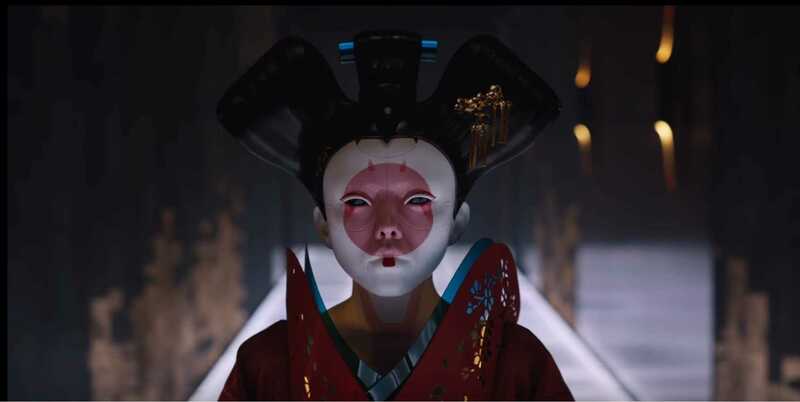 There’s nothing wrong with an Americanized version of Japanese properties, but Ghost in the Shell tries to bake its cake and eat it too. This ending isn’t clever or ever feel like it was done to stay true to the fans, but is pure negligence on the filmmakers part. If the girl was white this wouldn’t an issue, but the fact that she is an Asian character being literally embodied by a white actress is confounding. If you can look past the rather glaring flaws in the ending and the one-note characters, Ghost in the Shell is still entertaining at the bare minimum. Visually the film is gorgeous and Sanders does a great job capturing that cyberpunk feel that the anime helped define for generations. There’s a wonderful use of colors, CGI, and physical effects with the costumes being some of the best this year. This bleeds into the action sequences which all have a nice kinetic energy to them and a good sense of style that keeps the momentum going. Even though the climactic battle is slightly underwhelming, it was enjoyable from an action standpoint alone. Ghost in the Shell isn’t an abomination, but it’s one that could have been so much better. From a visual standpoint, the movie is nearly flawless in capturing the anime, but it falls apart narratively. Even though Johansson does a good job with the role itself, her character is inherently undermined by the movie’s bland and laughable ending. While the rest of the cast add a nice bit of personality to their performances, it’s just not enough, as the film never strives to truly showcase who these people are or why they’re special to Major beyond “being a team.” While Ghost in the Shell will be discussed for its controversies regarding race, the actual film offers nothing especially memorable — just go watch the anime instead.